Challenges and campaigns that make it worthwhile to get get onboard the SDG agenda and join in action. C-Change strategically convenes actors around the need for a new business agenda. Taking advantage of our global and national networks, we mobilize leading actors around the importance of the SDGs and the need for change and collaboration. We (co-) convened hundreds of executives and networks around the Agenda and the need to 'walk the talk of collaboration'. Initiatives included the Impact Summit Europe, a Dutch national SDG Investing Agenda. A global city-level BIZ4SDGs campaign is planned for end of 2018. Practical strategy, design, and facilitation support to clients looking to amplify their work and impact success. C-Change offers practical strategy, design, and facilitation support to both individual organizations or coalitions, and work with sustainability pioneers to roll out forward-looking corporate impact, social innovation, and impact investing agendas. Engagements include efforts with the United Nations, the Dutch financial sector and the Dutch Ministry of Foreign Affairs. Currently, we are working with The Rockefeller Foundation on an effort to accelerate the uptake of impact products by mainstream investors and capital markets. Offline and online brokerage and facilitation support, incl. plug-and-play collaboration tools and portals. C-Change offers customized partnership collaboration support as well as a set of online community and collaboration tools that allow individual organizations, networks and communities to capture, share, and multiply their impact. 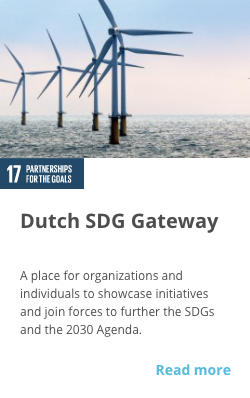 Our first national SDG portal is live in the Netherlands - the Dutch SDG Gateway is commissioned by the Dutch SDG Charter Coalition. With UNDP and the SDG Philanthropy Forum we are working on a global roll-out of national SDG community portals. Because of our client and thought leadership work, our team is able to have a helicopter view on the field. This means that invariably we will encounter critical, system-level bottlenecks or opportunities for change that none of our clients can individually tackle. For this reason, C-Change has initiated various 'collective action programs' that require networked action and is part of a number of consortia seeking to incubate system-level, transformative solutions.